What a strange old La Liga season it’s been so far! Only in the last week or so have Barcelona started showing the form that made them champions last season, and they sit deservedly at the top of the table. Atletico Madrid are well ensconced in the bun fight just below them and despite being in fourth, they are just two points behind the Catalans with an attractive Madrid derby at Leganes next on their agenda. Los Pepineros (The cucumber growers) as Leganes are affectionately known, haven’t had the best of starts this season, an incredible home win against Barcelona notwithstanding. With the greatest respect, that was more to do with the Blaugrana’s complacency and Lady Luck also being on the side of Mauricio Pellegrino’s side on the day. Diego Simeone has his Atleti side well-drilled and they’ll certainly not be taking their opponents lightly, despite their current position; third from bottom. Though rotation is an option for El Cholo, it wouldn’t be a surprise to see the Argentinian playing his strongest possible side, even with a Champions League match against Borussia Dortmund coming just three days after this fixture. The Spaniards certainly won’t want another hammering at the hands of the expansive Germans, equally the club have made a big play of being genuine contenders for La Liga. Indeed, it was precisely such rhetoric which ensured Antoine Griezmann stayed at the Wanda Metropolitano rather than sign for Barcelona in the summer. In the four league games played to date between the two sides Leganes have yet to score, and both matches at Butarque have ended goalless. Even in their current good form Atleti still don’t score highly – as most of their results from this campaign would attest. However, their single goal victories have been peppered by the odd game where they’ve manged two or more goals, including on their last visit to south Madrid when they played Getafe. Leganes just haven’t got going and the Rojiblancos can take full advantage of their stuttering start. A front line that will include Antoine Griezmann and Diego Costa, as well as supplementary presence from Thomas Lemar and Saul Niguez, will be too strong for the hosts. It may take until the second half to see Atleti’s play bear fruit, but a superior work ethic will eventually get its reward, so Ladbrokes’ 11/2 on a 2-0 away win looks appealing. After a disappointing opening to their campaign, the supporters will expect Leganes’ players to show the same levels of commitment that they did against Barcelona and be on the front foot throughout. Pellegrino must be fearing for his own position and how he sets his team up will dictate the pattern of this match, certainly in the first 45. There has been a sense of Butarque being something of a bogey ground for Atleti given their inability to score there before now, and a shut-out before the break will do nothing to dispel that notion. The Rojiblancos simply can’t afford for Barcelona to go further clear at the summit at this point, with a fixture against the Catalans coming up in two league games’ time. A win there too for Ernesto Valverde’s side would mean an eight-point gap; almost insurmountable. With Diego Godin and Stefan Savic solid in central defence, that is the platform for Atleti to build from against Leganes. A tense, perhaps nervy opening to the match is to be expected, with the visitors opening up after half-time. Superior movement and fitness will hold Simeone’s men in good stead and will help to make the game safe late on. Level at half-time with Atleti to emerge victorious after 90 minutes is a worthwhile bet at the 16/5 odds on offer with BetVictor. 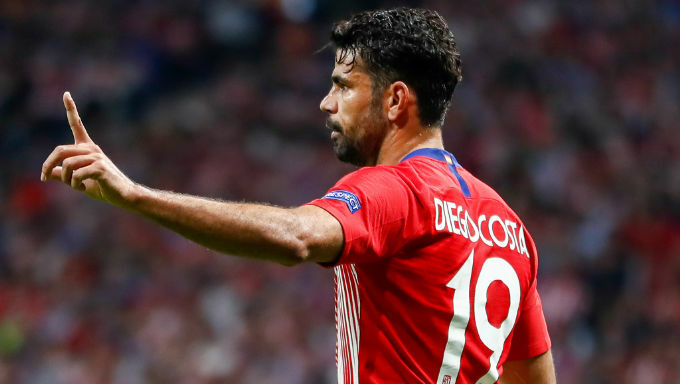 Atletico’s battering ram of a centre-forward, Diego Costa, has been amongst the goals in European competition this season but not in La Liga. In fact, we have to go way back to the end of February and the Rojiblancos’ 5-2 win over Sevilla at the Ramon Sanchez Pizjuan for the last time he netted in the league. The Spanish-Brazilian has come close this season already but has snatched at a few presentable chances. It’s noticeable too now that his team-mates are deliberately trying to get him on the score sheet to restore some confidence. Leganes have been brittle at the back and Costa doesn’t need asking twice to create havoc. Once the door has been pushed open, there’ll be plenty of chances for a second goal, and with Costa on the prowl, expect him to finally break his duck in the 2018/19 domestic campaign. Betway have the best price on Costa to score any time at 2/1, while Bet365 go 9/2 on the former Chelsea man scoring the last goal of the game.